During the 1920s, many anti-marijuana campaigns were conducted to raise awareness about the many harmful effects the drug caused. These campaigns included radical claims stating that marijuana turned users into killers and drug addicts. They were all obviously fake, and made up in an attempt to get rid of Mexican immigrants. We begin to see newspaper articles appearing during the 1920s that were demonizing marijuana. In February 1925, as states were beginning to ban marijuana, the Times reported that a 27-year-old Mexican named Escrado Valle, “crazed from smoking marihuana…ran amuck today in a local hospital and killed six persons before he could be subdued.” Later that year it announced that the Mexican government had banned marijuana “To Stamp Out Drug Plant Which Crazes Its Addicts.” In 1927, the Times picked up on the theme of marijuana-crazed Mexicans again, reporting that “a widow and her four children have been driven insane by eating the Marihuana plant.” The paper cited “doctors” who “say that there is no hope of saving the children’s lives and that the mother will be insane for the rest of her life.” Yet according to the story, the family accidentally ate fresh cannabis plants, which are not psychoactive. “A widow and her four children have been driven insane by eating the Marihuana plant, according to doctors, who say that there is no hope of saving the children’s lives and that the mother will be insane for the rest of her life,” read a New York Times story from 1927. There has been much speculation that the reason for the campaign against cannabis began as an effort to demonize the hemp industry because it was feared to be a low-cost substitute for paper pulp. The paper industry, and more specifically the newspaper industry, led the charge against cannabis with Anslinger. William Randolph Hearst was a major player in demonizing marijuana. The lawyers involved in crafting the marijuana tax commended Hearst for his relentless published articles and “for pioneering the national fight against dope.” Hearst was a major newspaper publisher but also had significant investments in the paper industry. 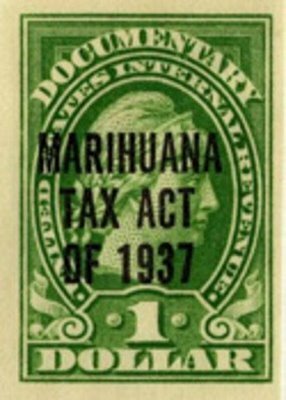 It was Hearst who pushed hard for the regulation and tax on Marijuana beginning in 1932. Andrew Mellon and the DuPont family also had major investments in the timber and newspaper industries and a rise of hemp would have seemingly undercut their profits. Curiously, years later, manufacturing paper with hemp as the raw material proved that hemp lacks the qualities needed to become a major competitor of the traditional paper industry, as it does not contain a high enough concentration of cellulose to be an effective substitute.